On the 1/10/16 on my way back from Dunfanaghy, Co. Donegal I decided to call to Bundoran to take some photographs. I had two images in my minds eye to capture in Bundoran. I had called there on the way up but conditions were not right. The tide was way too far in and the sea was too rough. On my return visit I tried to plan it so that the tide would be just right but I over did it and the tide was too far out. In any event the conditions were too calm for what I wanted to do. I went for something to eat and to think of my next move. I decided that even to wait for the tide to be right where I wanted, it would not work on this occasion as the other factors necessary for what I had in mind weren’t going to be in place. I could see that the sky was clear and the sun was going down nicely. 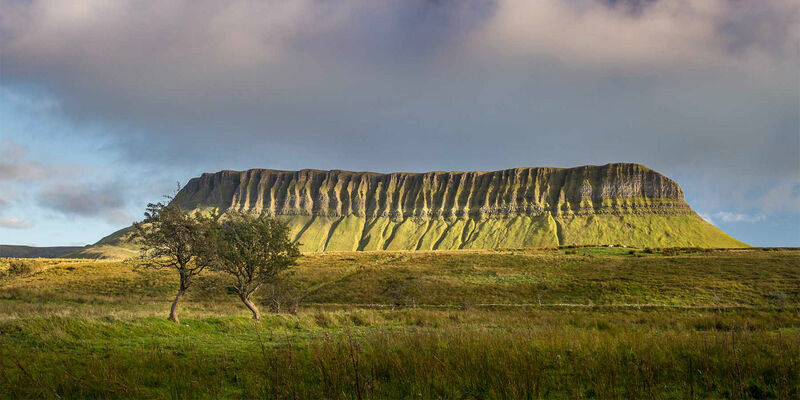 I always wanted to photograph the magnificent Dartry mountain range and Benbulbin mountain in particular. I thought that this evening all the conditions were right for just that so I headed for the nearby Dartry mountains in County Sligo. As a child I could see the Dartry Mountains from my grandmothers house in Bundoran. I always wanted a picture of Benbulbin to display as wall art in my own home, as it would bring back memories of the view from my grandmothers home. It now looked like I was now in the right place at the right time. I had tried to photograph Benbulbin before but I was always going to or coming from some place and didn’t have the time to explore and get the right perspective. This time I had the time and conditions were perfect. Benbulbin is undoubtedly Irelands most distinctive mountain, it is sometimes referred to Irelands very own ‘Table Mountain’ On other occasions that I tried to photograph Benbulbin I did so from the main road and houses and/or trees and wires got in my way. This time I got up close. I went up numerous little boreens and tracks with grass growing down the middle of them. This made all the difference. The sun was going down beautifully and as time was going by I found that Benbulbin was looking better and better. The warm light of the sun bathed Benbulbin in a beautiful warm glow. This evening light was spectacular. The light was raking across the face of the mountain. The angle of the light was accentuating the crevices and gullies on the mountainside that were left behind by the ice age glaciers cutting through the landscape. I had started to photograph the Dartry mountains at 4pm and just before 7pm I got the shot I had come for. Three hours of anticipation and eventually great satisfaction. I headed home very happy that I had got a fantastic image of one of the most beautiful mountains in Ireland, that was now destined to be a striking piece of wall art in someones home. The two images I have in mind at Bundoran will have to wait for another day.